To Cite: Hatam N, Askarian M, Bastani P, Pourmohammadi K, Shirvani S. Cost-Utility of Screening Program for Neonatal Hypothyroidism in Iran, Shiraz E-Med J. 2016 ; 17(1):e33606. doi: 10.17795/semj33606. Background: Hypothyroidism, a preventable cause of mental retardation, is one of the most common diseases of the endocrine gland in children. The disorder can be corrected if it is identified and treated within the first few days of birth. In Iran, hypothyroidism is estimated to affect one out of 400 to 900 neonates, which is much higher than the global average. Objectives: This article is conducted to investigate the most cost–utility option i.e. whether to implement the neonatal screening of genetic hypothyroidism or to merely treat such patients in the absence of the screening process. Patients and Methods: The present research is a cross-sectional, descriptive and analytical study. The provider perspective was employed to calculate the direct costs imposed on Shiraz University of Medical Sciences, insurance organizations, charities and patients concerning the implementation of screening program and the treatment of detected cases along with the direct costs related to patients treated in the absence of the screening process; costs related to death were excluded. The statistical population of the study consisted of all 81837 newborns referred to university laboratory in Shiraz in 2010. In order to measure the utility, time-trade-off method was employed to determine the life quality of patients. Results: The incremental cost-effectiveness ratios (ICER) of hypothyroidism, calculated through dividing the cost difference (∆C) by utility difference (∆QALY), indicated that screening saved a total of 13413 US. $. Conclusions: The economic evaluation (cost-utility analysis) resulted from the comparison of the above choices revealed that implementing the screening plan can actually be better and more cost-effective. Congenital metabolic diseases are biochemical maladies impairing the metabolic mechanisms. This illness manifests itself within the first week of the birth, a fact which makes it different from other congenital diseases that are apparent at birth. Moreover, since the signs and symptoms of metabolic diseases in infancy are nonspecific (1), disorder is not detected until some months or even years and hence the complications may become irreversible (2). Of approximately 7.6 million children annually born with congenital abnormalities, 90% are in low income countries. In the US, around six million have such abnormalities while Iran with one fourth of the US population has the same number of such patients (3). If congenital abnormalities are not detected early enough, the children will be susceptible to many disorders including severe brain damage, mental retardation up to 50%, paresis, liver problems, renal stones, cataract, glaucoma and heart diseases. These problems not only result in low life quality for both the infant and the family but also put heavy financial pressure on the families and ultimately on health care system. Accordingly, the identification of such a disease at birth is a necessity if the infant is to lead a normal and healthy life. If not treated, this disease can lead to progressive cerebral damage to 60 units by the end of the first year (4). Hypothyroidism, a preventable cause of mental retardation, is one of the most common diseases of the endocrine gland in children. The disorder can be corrected if it is identified and treated timely, that is within the first few days of birth (5). In general, the incidence of genetic hypothyroidism is about one in 3000 to 4000 live births worldwide (6). In Iran, the incidence is estimated to be one out of 400 to 900 live births, which is much higher than the global average. The prevalence of the condition is one in 914 live births in Tehran, 1423 in Fars and 370 in Esfahan provinces (7, 8). The nationwide project of screening hypothyroid neonates started in 2005, covering more than 90% of the whole country. So far, more than five million are screened and a huge number of people are diagnosed and treated. It is crucial, however, that the authorities of the ministry of health, treatment and medical education investigate the costs and the utility of the screening process of hypothyroid newborns on a national scale and further designate appropriate plans. In this regard, in 1977 the U.S federal general accounting office estimated the life-long costs related to the medical and institutional care of an untreated hypothyroid newborn US. $ 330.000. According to the report of the U.S. office of technology, in 1988 for each diagnosed hypothyroid neonate, US. $ 93.000 was saved. Furthermore, the 1995 report of the same office indicated that the interest-cost ratio of hypothyroid screening and its absence was ten to one; the same ratio varied from 7 - 11 to 1 in other studies (9-12). It is worth mentioning that the cost-benefit ratio in countries performing hypothyroid screening depends on factors such as disease prevalence, screened population, currency value, inflation rate, government, private sector and families’ manner of financial cooperation, cooperation of insurance companies, total healthcare cost and so forth (13). In Iran, the cost-benefit ratio of the plan was estimated 1 to 14 (14). After the actual implementation of the project, such ratio turned out 1 to 22 (15), revealing that owing to the high prevalence of this disease in the newborns, such plan can be quite helpful in the country (16). The implementation of the screening project seems to be necessary due to the following reasons: screening tests are highly sensitive and in the case of diagnosis, the treatment would be way easier to perform without any need for costly medical measures; moreover, the cost-benefit ratio of this plan is 11 - 7 to 1 in the world and 7.8 - 1 in Iran (12). In a study conducted by Yarahmadi et al. 2745 patients were temporarily treated where the 98820 intelligence coefficient was retained (17). Hisashige et al. in a cohort study by Kaplan-Meier estimator measured the cumulative mortality of newborn per million children in six years was 15.33 for the screened group and 32.63 for the non-screened group. Also the Cost-benefit analysis of newborn screening indicated that costs and benefits per newborn case finding by high performance liquid chromatography (HPLC) screening were $ 138,800 and $ 170,800, respectively. Net benefit was $ 3,200 (18). In the study by Leonila and Carmencita a total of 28,088 newborns (40% of 69,391 live births) were screened. Assuming that a cohort of 200,000 newborns would be screened in one year, the net costs for the screening program were US. $ 2.4 million. If the timing of blood collection was after 24 hours, there was a net benefit of US. $ 0.6 million. The incidence of congenital hypothyroidism (CH) among the hospital admissions in Metro Manila was 0.037% (95% CI 0.009 - 0.064%). The net cost of a screening program for CH taken after 48 hours was US. $ 2.4 million. In this study newborn screening for CH was cost-beneficial if blood collection occurred after 24 hours, so that expense of an additional hospital day was not incurred (19). In a study by Tiwana et al., the lifetime incremental cost-effectiveness ratio for expanded versus pre-expansion screening was about US. $ 11,560 per QALY. In other words, expanded newborn screening does result in additional expenses to the payer, but it also improves patient outcomes by preventing avoidable morbidity and mortality. The screened population benefits from greater QALYs as compared with the unscreened population in Texas (20). In this respect, it is necessary to investigate the most cost–utility option that is: to implement the program of neonatal screening genetic hypothyroidism disorder or not to do it and only try to treat such patients. Consequently, using accurate and efficient tools and techniques are essential. One of the most important ways is economic evaluation, and cost-utility analysis is also the best and most applicable technique in this evaluation. It not only provides an estimate of lifetime and quantity but also takes life quality into consideration. This technique compares the interventions with one another based on the cost per unit and aims to maximize the utility in spite of limited resources. In Iran, the neonatal screening program to detect phenylketonuria, congenital hypothyroidism, glucose-6-phosphate dehydrogenase (G6PD) deficiency and phenylketonuria is under way. Regarding the limited health resources, the increased expectations and requirements of the society and allocation of optimum resources to this health problem, the newborn screening is a challenge. Despite the many studies on the cost-benefit and cost-effectiveness of newborn screening programs conducted by surveys on cost-utility of neonatal screening plan and measurement the quality of life and its effects on various aspects of family life are not considered yet. Therefore, the current study aimed to measure the cost–utility of newborn screening program in order to offer new aspects of this plan for policy makers and also bring about the valuable epidemiologic information for health planners in Southern Iran. This research was a cross-sectional descriptive -analytical study. To calculate the costs, community perspective was employed in which direct costs imposed on Shiraz University of Medical Sciences, insurance organizations, charities and patients themselves due to the implementation of screening plan and treatment of the detected cases and also direct costs for patients in case of not to implement the plan were included but the direct costs such as the cost of death were excluded. This study will help health care policy makers. The current study used the upward/micro costing method for cost calculation. Authors calculated the costs based on input resources which were mainly capital and current resources. To determine the cost of screening program the specific costs of genetic hypothyroidism were calculated and the other costs that the ministry of health supported were shared to each case. The statistical population of the study consisted of 81837 newborns referred to the university laboratory in Shiraz in 2010. All of them were included in the study and also informed consent was obtained from all parents whose neonates participated in this study. This study involved a cost-utility economic evaluation based on decision tree model, aimed to make the best decision when dealing with at least two alternatives. The first step in making a decision tree is to clearly define the problem whereby boundaries are determined as to the main structure of the tree. Next are the calculation and general outline of the probable estimates and the valuation of all the costs and outputs at the end of each line. In this step, the reliability of the estimates totally depends on the quality of the data, meaning that each bias in the data will ultimately lead to a bias in the modeling results. Since certain data are inherently unreliable, and might therefore result in uncertainty, it is necessary that the odds of each modeling section remain unchanged to employ them in the sensitivity analysis of the following step (21). Pricing and valuation can be taken care of once the odds of each possibility node (shown through circles in the are are found or acceptable hypotheses are worked out. The following diagram illustrates the decision tree of the newborns screening plan concerning hypothyroid patients (Figure 1). In the costs section, the costs of screening process should be compared with those of the treatment of unscreened hypothyroid patients. In this section, all the capital and current costs concerning the implementation process were calculated by the financial documents. In order to evaluate the treatment costs of an unscreened sample of 18 patients, authors used medical records, physicians’ opinions, the number of annual hospitalizations and a list of the services provided for the patients. 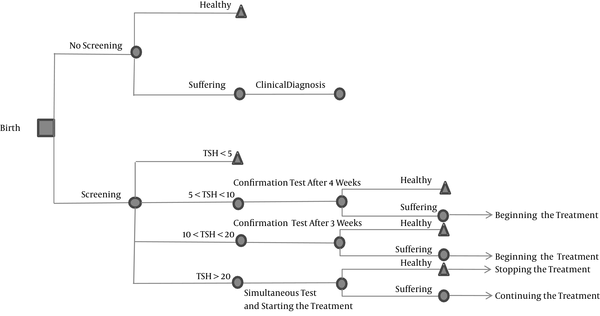 Moreover, to calculate the total treatment cost of hypothyroid patients, the decision tree model and the likelihood of disease in the absence of screening were employed. Finally, the tariffs of the private sectors were used to calculate the cost of each service package. In order to measure the utility, we employed time-trade-off method was employed to measure the life quality of patients. In this method, the respondent is required to choose between two certain alternatives. For states better than death, one of these alternatives is to live in a state less than full health for a defined period of time and then die. The other alternative is to live for a shorter period of time in full health and then die (22). The confidence interval was 95%, the power was 80%, the standard deviation was 3, the minimum error difference was 2; therefore, the sample size was 36. In the present study, new intervention was synonymous with the screening plan; while old intervention referred to the absence of a screening plan. The costs of newborn screening process (including both the capital and current costs) and the treatment cost of the patients diagnosed with the disease were added and then subtracted from the treatment cost of patients with the disease. The resulting number was then divided by the result of the “QUALY” subtraction (calculated via the temporal exchange of the two states); the result of such division indicates ICER. Since the benefits and results of the screening process present themselves in the future, in order to estimate the current value of screening (expectancy of a longer and higher quality of life), the future costs of treatment and life quality were reduced through a 3% reduction rate. The data used in the economic evaluation might not be altogether correct (as there is the possibility of bias or error in measurement). Accordingly, the sensitivity was analyzed to prevent or reduce such error and indicate the precision of the results. The higher and lower ranges of cost, reduction rate, the prevalence of the disease, and life expectancy, were determined after 20% of each variable was added to and subtracted from its original amount. To determine the higher and lower ranges of utility, the reliability distance around the mean was calculated with a 95% reliability coefficient, then they were added to and subtracted from the mean. The ranges of each variable were specified, and then the sensitivity analysis was conducted through one-way and two-way methods whose results were respectively presented via net monetary benefit index and worst–best analysis. In Fars province, newborn screening plan is practiced since 2005. In this program, all the newborns of the province are tested for the presence of diseases such as phenylketonuria (PKU), hypothyroidism, galactosemia, and favism. The current study investigated the findings related to the cost-utility of hypothyroidism. In this regard, the average cost of screening 81837 newborns in Shiraz was estimated. Table 1 shows the data related to the screening costs, and the treatment costs of screened and unscreened patients. As can be observed, the total cost of the screening test for hypothyroid patients was US. $ 121057; it should be noted that a single screening test was worth US. $ 2. Moreover, based on the documents available in the noncommunicable sector of Shiraz University of Medical sciences, the total treatment costs of cases whose screening test results were positive was US. $ 1040. According to the same documents, US. $ 1040 in the first year, US. $ 1039 in the second and third years and US. $ 7060 from the fourth year onwards. In order to estimate the treatment cost of unscreened hypothyroid newborns imposed to the health system, the medical records and documents of 18 patients were retrieved and studied together with the list of the services they received throughout their stay. Three endocrinologists were then interviewed regarding the number of times these patients might be hospitalized in a year. Based on the private sector tariffs, the total cost of the aforementioned services was estimated US. $ 7060. It is worth mentioning that up to the year 2011, 81837 newborns were referred to the screening lab, among which 20 were diagnosed as hypothyroid. It should also be noted that the above cost is for the life time of these patients, and was estimated after reducing the following years’ costs. Therefore, to calculate the utility, time trade-off was employed (a direct utility measurement method) and its results (comparing the utility of hypothyroidism with and without screening) are mentioned in Table 2. The results concerning cost-effectiveness analysis and ICER-based comparison of various interventions determined the interventions (screening and no screening) that make better use of the resources. As observed in Table 3, the negative incremental cost amounts indicate that the costs related to patients who undergo early screening, diagnosis and treatment are less than those of the ones who do not. Furthermore, the information regarding the effectiveness of screening implies that it is for those who take part in screening that “the quality adjusted life years” increase. In other words, the incremental cost-effectiveness of hypothyroidism is located in the fourth quarter, meaning that screening is the dominant and cost-effective choice. The ICER of hypothyroidism, calculated through dividing the cost difference (∆C) by utility difference (∆QALY), indicates that with screening, a total of US. $ 13413 was saved. Based on the above findings, the annual treatment cost of an unscreened hypothyroid patient is higher than that of a screened one; moreover, the life quality of screened patients is twice as those of the ones who have not been screened. Congenital abnormalities are among the major causes of death before birth and during infancy (23) and the prevalence of such diseases in Iran is higher than the global average; hence, the necessity of efforts to preempt such abnormalities is inevitable. In addition, the scarcity of resources in the health sector and the increasing expectation of the society from this particular sector make it more crucial to optimally allocate the resources and pay heed to the efficiency and effectiveness of health interventions. Moreover, it is highly crucial to study and select the most cost utility choice between implementing/not implementing the newborn screening plan. The economic evaluation (cost-utility analysis) resulted from the comparison of the above choices revealed that, from a community point of view, implementing the screening plan can actually be better and more cost-effective; the implementation cost of hypothyroid newborn screening plan was US. $ 1040 in the first year, US. $ 1039 in the second and third years and US. $ 7060 from the fourth year onwards, while based on the results of the present research, in case of no screening, a year treatment cost of the patients would be US. $ 7742. Moreover, the average utility of patients under treatment and screening and those merely under treatment turned out to be 0.889 and 0.469 respectively, based on time-trade-off. The ICER of hypothyroidism indicated that, with screening, US. $ 13178 was saved. Furthermore, the results of hypothyroid screening plan showed that the treatment costs of the screened patients were lower than those of the ones who were not screened and the latter group had a way lower utility compared with the former; hence the cost-effectiveness of the screening plan. Carroll et al. estimated the cost of each hypothyroid screening test US. $ 5, which is US. $ 1.5 different from what was estimated in the present study; moreover, the treatment costs of hypothyroid patients were US. $1,110,042, the US. $7548 difference with the current research (where only direct medical costs were considered) being due to the inclusion of non-medical costs in the Carroll study. The utility of the patients with the disease in the mentioned study was 0.3909; however, was similar to that of the current study that was 0.469. Also, the presence of hypothyroid screening proved to be more cost-effective than its absence in both Carroll and Gill researches (conducted in Australia) (9, 24). The results of the below mentioned studies are approximately the same as those of the current study. Hisashige et al. in a cohort study by Kaplan-Meier estimator measured the cumulative mortality of NB per million children at six years was 15.33 for the screened group and 32.63 for the non-screened group. Also the cost-benefit analysis of NB screening indicated that costs and benefits per NB case finding by HPLC screening were US. $ 138,800 and US. $ 170,800, respectively (18). In another study by Tiwana et al., the lifetime incremental cost-effectiveness ratio for expanded versus pre-expansion screening was about US. $ 11,560 per QALY. In other words, expanded newborn screening does result in additional expenses to the payer, but it also improves patient outcomes by preventing avoidable morbidity and mortality. The screened population benefits from greater QALYs as compared with the unscreened population in Texas (20). Also in the study by Leonila and Carmencita a total of 28,088 newborns (40% of 69,391 live births) were screened. Assuming that a cohort of 200,000 newborns would be screened in one year, the net costs for the screening program were US. $ 2.4 million. If the timing of blood collection was after 24 hours, there was a net benefit of US. $0.6 million. The incidence of CH among the hospital admissions in Metro Manila was 0.037% (95% CI 0.009% - 0.064%). The net cost of a screening program for CH taken after 48 hours was US. $ 2.4 million. In this study newborn screening for CH was cost-beneficial if blood collection occurred after 24 hours; therefore, expense of an additional hospital day was not incurred (19). In a research, entitled cost-effectiveness and cost-utility analysis of hypothyroid newborn screening in the Iranian national plan, Yarahmadi et al. considered the effectiveness criterion to be the ratio between the intelligence quotient (IQ) of screened patients and that of normal people; there was a recognizable difference between the two IQs; the average IQ of newborns treated at the moment of birth was 15.7 scores higher than those of the ones diagnosed 30 days later, indicating that not only the screening plan is cost-effective but it can also prevent mental retardation (25). Further proof of the current study findings is the results of two-way sensitivity analysis conducted through a 20% addition and subtraction of each variable to and from its original value. Regarding the two-way sensitivity analysis of cost and utility, US. $12603 can be saved provided that the utility is at its highest and the cost is at its lowest. In the end, based on the findings of the present research, hypothyroid screening can not only be economically beneficial, but it can also maintain the IQ of the patients, prevent mental retardation and complications in growth. This research, derived from proposal No. 90-5887, was conducted by Mr. Samad Shirvani as part of the activities required for M.S. degree in health care management of Shiraz University of Medical Sciences. Authors deem it necessary to express their greatest gratitude to the research administration of Shiraz University of Medical Sciences, for the financial support that they bestowed, and to the health vice president of the university, Dr. Mohsen Moqaddami, for data collection.